Each year the Tasmanian Department of Treasury and Finance runs a community consultation seeking views of Tasmanians on what they would like to see funded in the upcoming budget. The State Government have not funded a Tasmanian Human Rights Act in the 2018/19 Budget. In the lead up to the Tasmanian State Election being held on Saturday 3 March 2018, the Tasmanian Human Rights Act campaign surveyed all candidates about their support for a human rights act for Tasmania. Our survey shows clear differences between the parties. Both the Greens and Labor are committed to a Human Rights Act with the Liberals saying human rights are already sufficiently protected. The Greens said that, as well as legislating a Charter of Rights, they would establish a Human Rights Commission, whereas Labor said it will set up a Premier's advisory panel to determine what form a Human Rights Act should take. Excuse: "most Tasmanians are confident that their basic rights are protected"
Response: less than 1% (4 in total) of the responses to the Tasmanian Law Reform Institute (TLRI) inquiry into human rights in Tasmania agreed that human rights were sufficiently protected. Of the responses, 95% (388 in total) said human rights are not sufficiently protected in Tasmania. The TLRI reported on page 20 of its 2007 report: " Most respondents expressed the view that there are significant deficits in the protection of rights, that rights are not enjoyed equally by all members of the Tasmanian community and that current protections of rights are often uncertain, inaccessible and incomplete." Excuse: "the rule of law is strongly entrenched in our political culture"
Response: the rule of law requires that everyone be subject to the law, irrespective of their position, power or wealth. Unfortunately, there are examples of specific groups being exempted from requirements of the law including laws that protect specific human rights. The current debate on freedom of religion has highlighted to exclusions from discrimination law that have been provided to religious institutions in Australia. Excuse: "our system of democracy contains safeguards and includes common law principles that ensure many protections are upheld by our judges applying these principles"
Response: again, this was considered by the TLRI, which noted: "Weaknesses in the common law’s protection of human rights were also highlighted by the International Commission of Jurists. The TLRI noted in particular the extent to which legislation can be and has been used to override the common law as well as the failure of the common law to protect the rights of women and various minority groups". Excuse: "the Australian Constitution explicitly sets out a number of rights, including the right to vote (Section 41 ), protection against acquisition of property on unjust terms (Section 51 (xxxi)), the right to a trial by jury (Section 80), freedom of religion (Section 116) and prohibition of discrimination on the basis of State of residency (Section 117)"
Response: there is only one other right found in the Australian Constitution: the right of freedom of movement between States found in section 92. The Tasmanian Constitution protects two rights: the right to freedom of religion and the right to vote in State elections. These rights fall well short of the rights set out in the Universal Declaration of Human Rights and in the international human rights laws that Australia has committed to uphold. These express constitutional rights are discussed in detail in the Tasmanian Law Reform Institute's 2007 report on pages 29-30 and page 31. Excuse: "the High Court has established that additional rights for individuals may be implied by the tone and structure of the Constitution. For instance, the Court found that our parliamentary democracy essentially requires a measure of freedom for individuals to express political views and debate issues"
Response: again, this overstates the level of protection found in the Australian Constitution. The only rights that the High Court has established in this way is the right of political and governmental communication and protection from Parliament legislating to bypass the courts by legislating mandatory punishments for breaches of the law. These implied constitutional rights are discussed in the Tasmanian Law Reform Institute's 2007 report on pages 30-31. One of our priorities will be to educate Liberal members about the importance of such an Act, regardless of who wins government on Saturday. To review the detailed responses, please click on the LEARN MORE link below. ABC Community Conversation, 7 December. 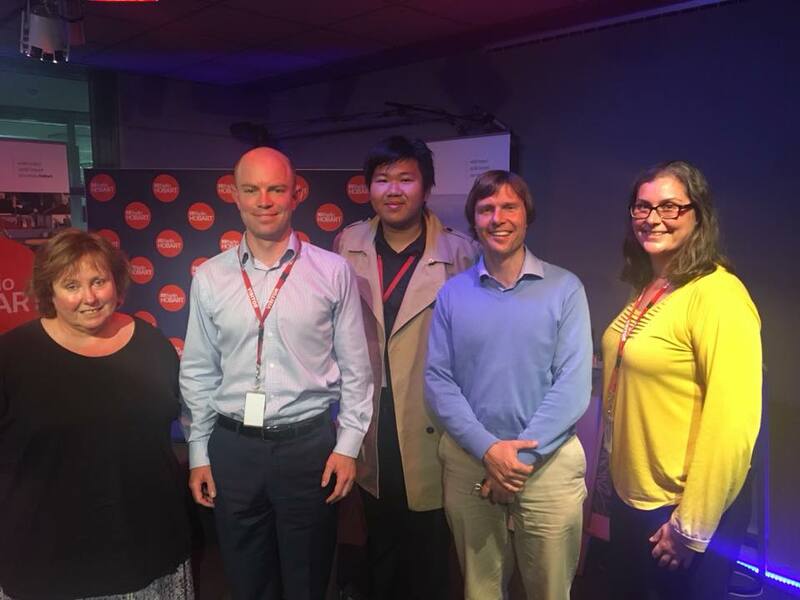 (left to right) Louise Saunders (ABC Presenter), Richard Griggs (Tas Director of Civil Liberties Australia), Bernard Goh (CLA member), Ben Bartl (Tenants Union solicitor) and Michelle Parker (Equal Opportunity Tasmania). 13 September 2017, Parliament House Reception Room, Hobart. 28 July 2017, Scotch Oakburn College, Launceston. 25 May 2017, Duke Hotel.